Homemade shepherd’s pie made with ground meat, vegetables, simple seasonings, and the most delicious cheesy mashed potato topping. 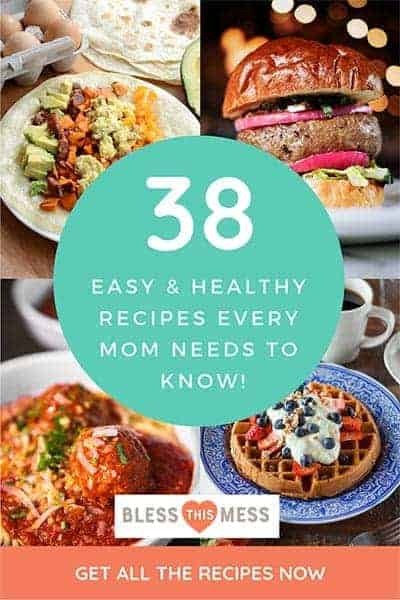 I love comfort foods that are family-friendly and all-in-one pan! 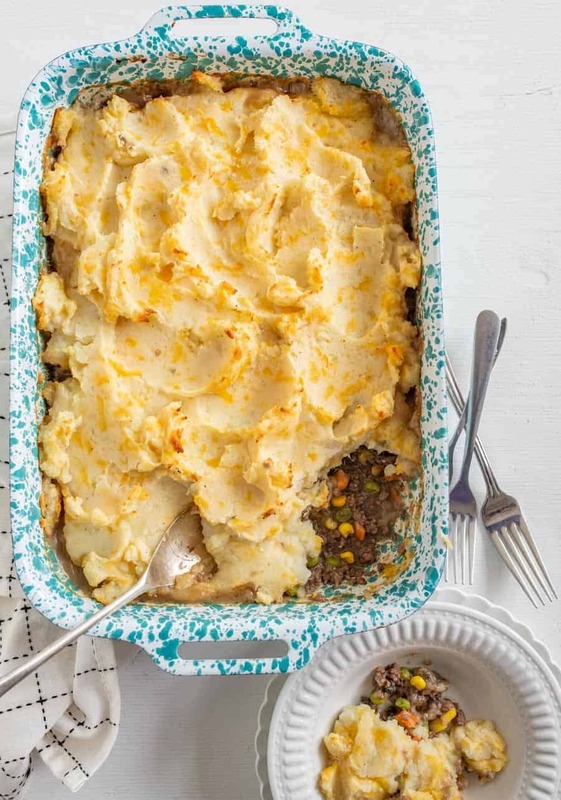 Shepherd’s pie is just that; you have your meat, veggies, and starch (hello mashed potatoes!) all in one pan and they go so well together. 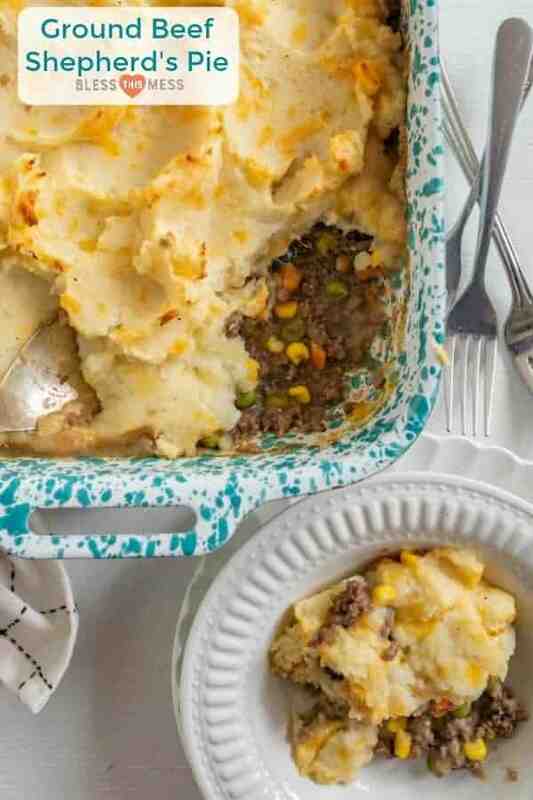 This recipe for shepherd’s pie uses ground beef because it’s easy to find and most of us have it around. Feel free to use a more traditional ground lamb or even ground turkey or chicken if you prefer. It’s a very customizable dish so make it what you like. The sauce for the meat and vegetables is made with a little bit of broth, Worcestershire sauce, and a corn starch slurry to thicken it up. It’s a bit like a homemade gravy that you make right in the pan. I use frozen vegetables for convenience and speed of cooking and the whole dish is topped with the most delicious cheesy mashed potatoes. My grandma Jane told me that she adds Parmesan cheese to her shepherd’s pie, so I had to do the same. By mixing in both cheddar and Parmesan into the potatoes before baking, you end up with a delicious topping with crunchy and melty bits of cheesed mixed throughout. It’s excellent. Serve this dish up with a green salad and some seasonal fruit and you have yourself one delicious and well-rounded meal within an hour. This is an easy dish to stick more vegetables in if you have them. Sometimes I’ll even double the amount of frozen vegetables called for, and it still turns out great. That being said, you can use other veggies that you like. I love green beans in this, too. That cheesy potato topping is so good! Feel free to mix and match cheeses with your preferences. Feel free to swap out the ground beef with more traditional ground lamb or even ground chicken or turkey. It all works well with this recipe. I think everyone needs a pretty speckled enamel pan. It just makes dinner more fun. 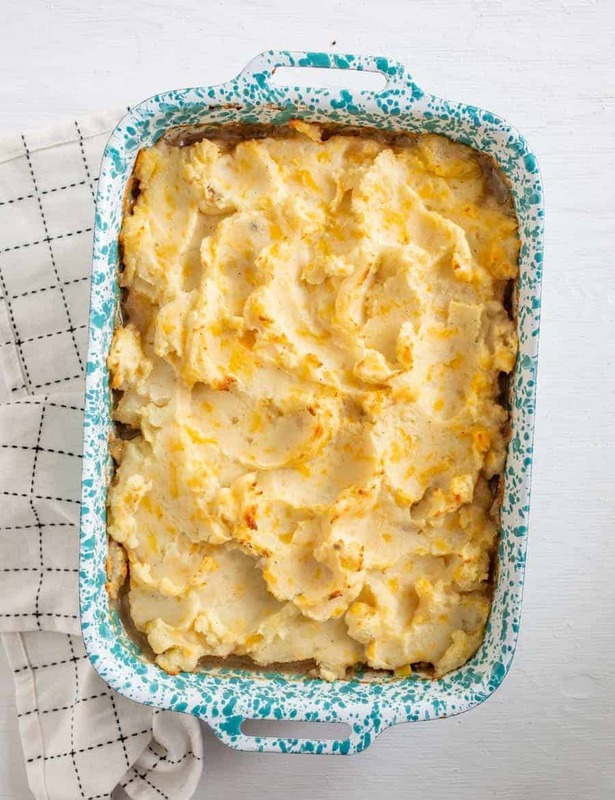 What type of potatoes are best for shepherd’s pie? I’ve found that classic russet potatoes work well for this dish and they lend themselves to light and fluffy mashed potatoes on top. I’ve also had great luck using red potatoes and leaving the skin on. You end up with a chunky colored mashed potato topping that is delicious and pretty. 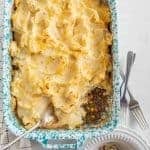 Can I freeze shepherd’s pie? Yes! Shepherd’s pie freezes very well. Assemble as directed but do not bake. Cover with a layer of plastic wrap (and press it down so that it’s touching the potatoes) and then top with a layer of heavy duty foil. Freeze for up to a month. Let the shepherd’s pie thaw overnight in the fridge before removing the foil and plastic and cooking according to directions (though you might need to add up to 10 minutes to the cook time if starting with cold potatoes). 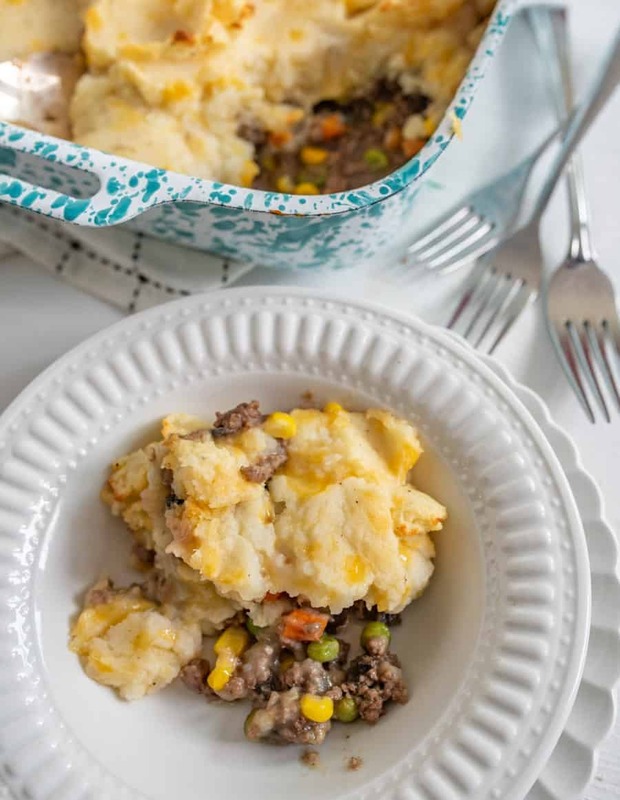 Homemade shepherd’s pie made with ground meat, vegetables, simple seasoning and the most delicious cheesy mashed potato topping. Peel and cube your potatoes and set them in a medium pot. Cover with water and bring to a boil over medium high heat. Reduce heat and simmer until potatoes are tender, about 25 minutes. While the potatoes cook, heat a large skillet over medium high heat and add the ground beef, mushrooms, and onion. Cook until the beef is cooked through and the vegetables are tender, 8 to 10 minutes. Add the garlic and stir to combine. Cook until fragrant, about 1 minute. In a small bowl combine the broth and corn starch. Mix well to combine. Add the corn starch slurry to the skillet and cook until slightly thickened, about 2 minutes. Add the Worcestershire sauce, frozen corn, and frozen peas and carrots. Stir to combine. Add the salt and adjust to taste. Add the mixture to the bottom of a 9×13 casserole dish or baking pan, or if your skillet is oven proof, leave it in the skillet. When the potatoes are soft, drain the water and place the potatoes back in the pot they cooked in. Add the milk and butter and mash well with a fork or potato masher. When potatoes are mashed, stir in the Parmesan and cheddar cheese and adjust the salt and pepper to taste (you’ll need at least 1/2 teaspoon of salt in the potatoes). Spread the mashed potatoes evenly over the top of your beef mixture. Bake in a 400 degree F oven for 30 minutes. Thanks for stopping in to enjoy this simple classic with me and I hope you get to making it soon. Put it on your menu for the coming week – you won’t regret it. And might I suggest doubling the recipe and sticking one pan in the freezer for later? 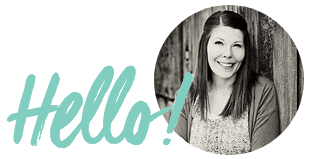 You’ll thank yourself later! Oh my this is yummy! I have never had Shepherd’s Pie and will be having it again and again! I got sloppy pouring the milk into the spuds….they were a bit runny but I’m sure tomorrow’s leftovers will thicken up fine. This is real comfort food!!!!! So glad that you liked it! Thank you for coming back to leave a review, that’s so helpful to me and the site. ENJOY!